What grabs headlines are the constant reports of Iran’s expansion of its nuclear program – including Iranian officials’ announcement just this week of a tripling of Iran’s enrichment potential. However, a more even keeled, unemotional approach was taken in an op-ed yesterday in the LA Times. Six former European ambassadors (who might actually know a thing or two about understanding and dealing with real-life, living and breathing Iranian diplomats and politicians) call for continued engagement with Iran. 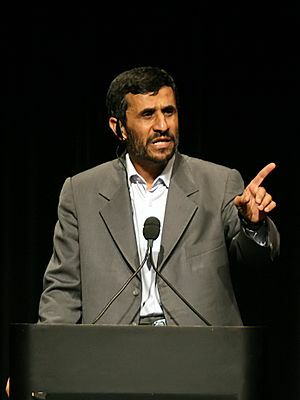 Instead of hyperbole, they calmly review some of the actual facts with regard to Iran’s nuclear program and indicate that by all accounts, Iran appears to have adhered pretty well to the requirements of the nuclear Non-Proliferation Treaty (to which Iran is a signatory – unlike some other countries). The main thrust of their argument, however, is that even while it is important to be watchful of Iran, the world should continue to attempt to engage with them. “Of course, a dilemma lingers in the minds of most of our leaders. Why offer the Iranian regime an opening that could help it restore its internal and international legitimacy? Should we not wait for a more palatable successor before making a new overture? This is a legitimate question, but we should not overestimate the influence of a nuclear negotiation on internal developments in Iran. Ronald Reagan used to call the Soviet Union the “evil empire,” but that did not stop him from negotiating intensely with Mikhail Gorbachev on nuclear disarmament. Should we blame him for having slowed down the course of history?